I struggled to stay within my art journey, due to my mental disorders. It is so easy to fall into self-doubts, when I am being told that most of my perspectives are not trustworthy, and that they are almost entirely delusional. I started out drawing again digital illustrations, [but] I went back to ballpoint drawings, because ballpoint pens are portable, and easy to work with. Social media has made me feel less lonesome, and helped me draw more, with enthusiasm. Social media gave me a renewed reason to stay drawing, and it showed me that people do care. I cannot perceive myself doing anything, except drawing, but I do incite poetry at times. Most of my poems are rebellious, vengeful, especially toward my voices, oppression. Lately, I have been fantasizing about being a pastor (again), but how can a schizophrenic be such a thing? I can only be an artist, because I have been proven many times that anything else is delusional. Then again, this world is not real. Lately, I have stopped writing much poetry, and now my music is dwindling, and now its getting difficult to draw. They are popping me out like a festering acne. I am non-medicated due to 18 years of interchanging psychiatric drugs, which never worked 100%, and now I am stuck with a dysfunctional stomach. Who to sue? Who to sue? I only wish—too poor. I only can sue by death. This world, I repeat, is not real. But still real, yet unreal, still real though. Read the Bible y’all, it can only get as real as can be by reading it. It is my psychiatric drug, and I am not allowed to prescribe anything, because I ain’t no Pastor, Doctor? This psychological self-portrait was created in October (2017) for the Deaf Inktober event. 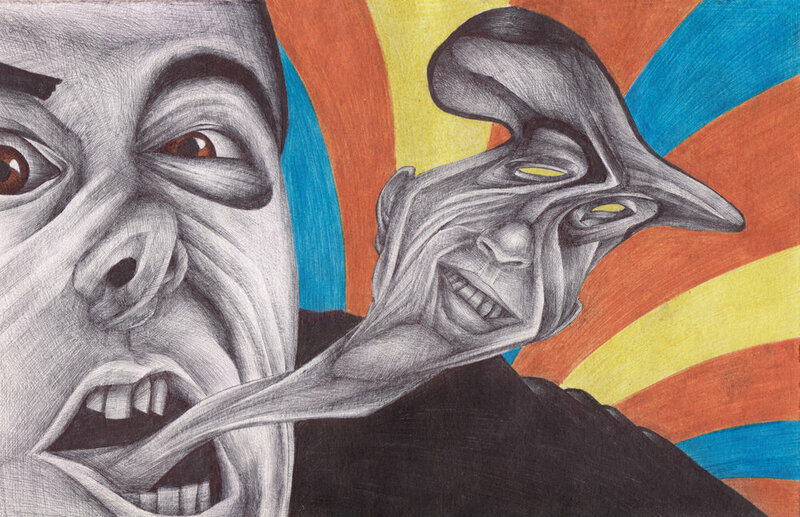 The work is a combination of two images from his personal social media presence; a central "funny face" and a secondary "shriveled spirit image."